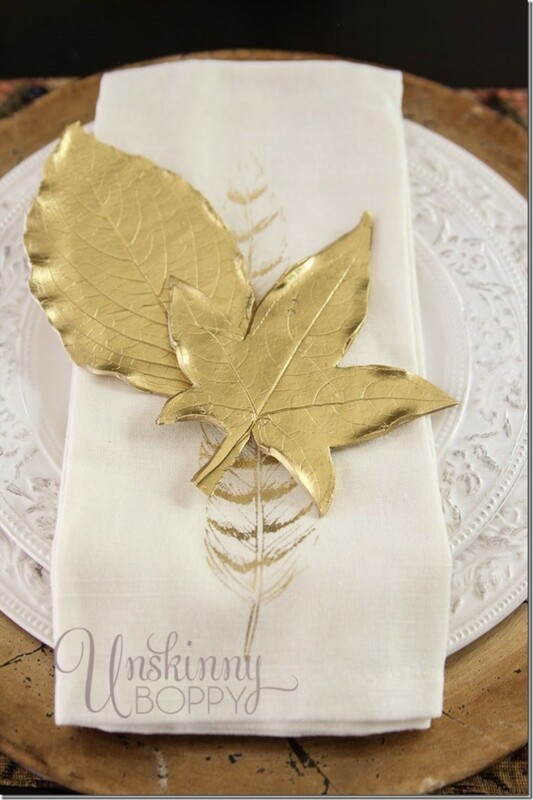 When I think about Thanksgiving, I don’t typically think about place settings and tablescapes. I think about turkey and dressing, family, football and red solo cups. But for all of you out there scouring Pinterest looking for inspiring Thanksgiving table decorations, this post is for you. Today I’m teaming up with TWENTY-FIVE fabulous bloggers to bring you some crazy gorgeous fall tablescapes that are going to blow you away. 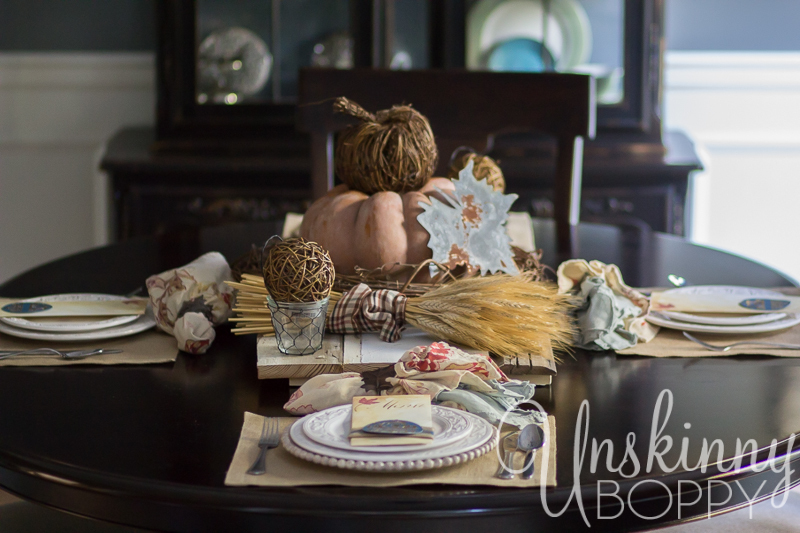 My table is filled with all things rustic and fall! 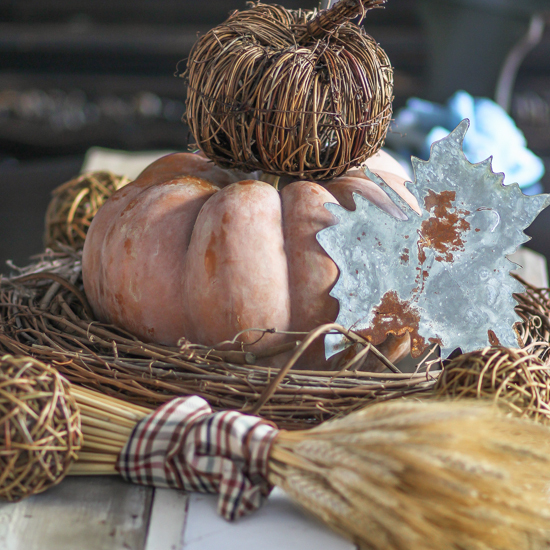 Pumpkins, wheat, grapevine wreaths, reclaimed wood, galvanized leaves… you name it, I’ve got it. 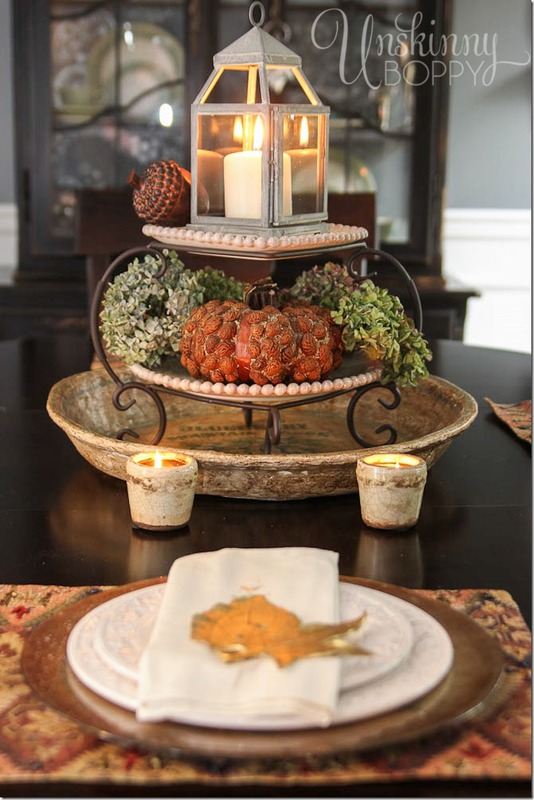 The centerpiece is layered like this: Reclaimed wood on bottom, grapevine wreath in center, pumpkin in the middle, then a few extras scattered around the sides. Since I can’t stand to sit down to a table and not be able to see over the centerpiece to talk to folks, I put everything onto one big piece of reclaimed wood so that it could easily be picked up and cleared off the table when dinner starts. Now, here is something you need to know about me. I have never in my life used a place card for a place setting. Not even at my own wedding! My family would look at me like I had three heads if I made them sit down in an assigned seat. But, I recently got a new Silhouette Portrait machine, so I decided to break that baby out and give it a whirl with this just-for-fun blog post! Envelopes! Yep, pre-printed envelopes. I had some pretty fall leaf envelopes in my desk, so I stole four of them, cut out some round blue cardstock circles and premade pumpkin labels on the Silhouette and attached it all together with some burlap fabric and tape. SUPER easy. I’m digging the way the gold foil cutouts looks on the blue cardstock. My hands are itching to play with that Silhouette some more now! I was loving how simple it was to buy all the premade templates and use my own fonts from my computer. This one is called Pumpkin Flourish by Kolette Hall. All of her designs are stunning, y’all! Yep, I am totally in love with how easy it was to cut out this beautiful shape on the Silhouette machine. No more cartridges that cost a fortune. Woot! Alright, who is ready for some more inspiration?? 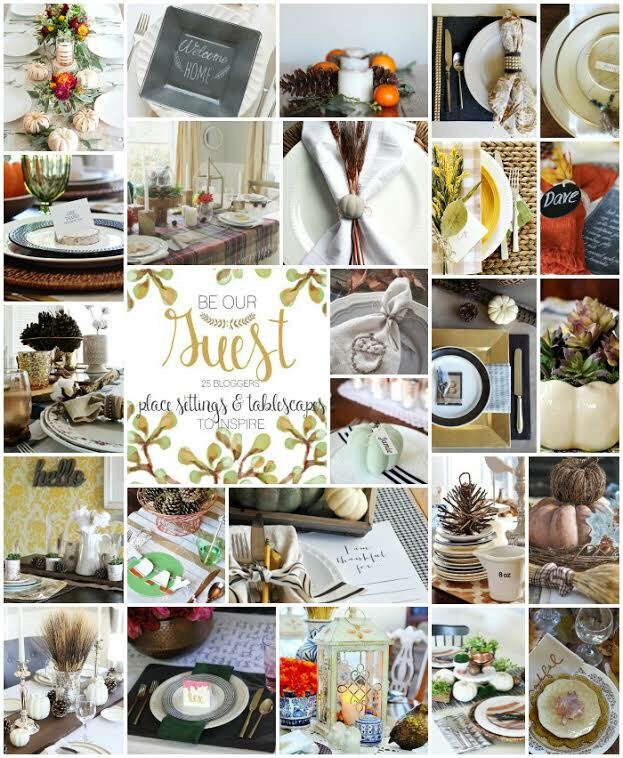 Head on over to these fabulous blogs for a TON of Thanksgiving Table Inspirations! Have fun hopping! Disclosure: Silhouette sent me a free Portrait machine, along with the gold printable foil. All opinions are my own. I love all of your touches Beth! Have a great week!!! Happy early Thanksgiving rock star! Beth I love that you can move that centerpiece so quick and easy when you need to! 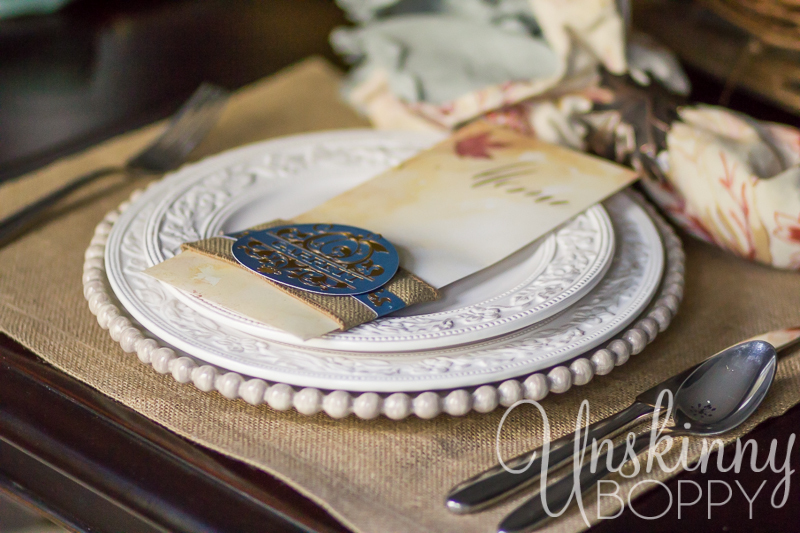 I love pretty tablescapes and yours is wonderful! I love my silhouette – you are gonna have so much fun! Lovely!! The gold foil is beautiful. 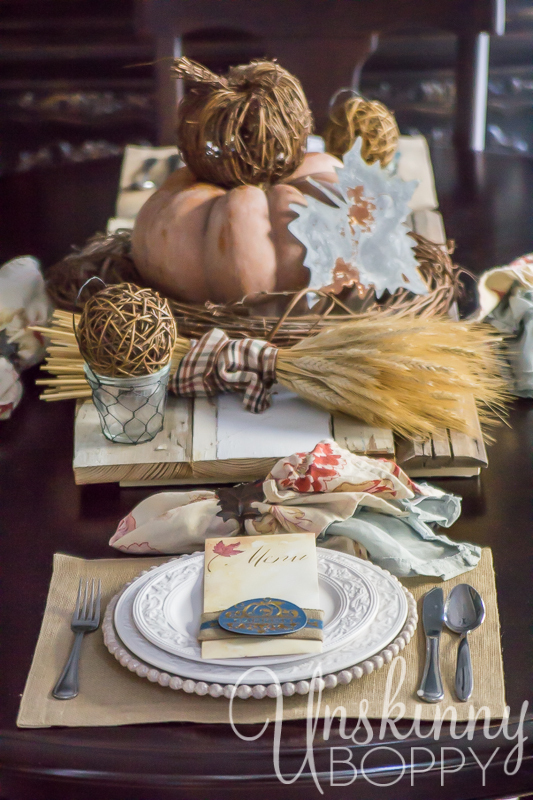 Love your rustic centerpiece, it looks fabulous. The reclaimed wood base is a fabulous idea. 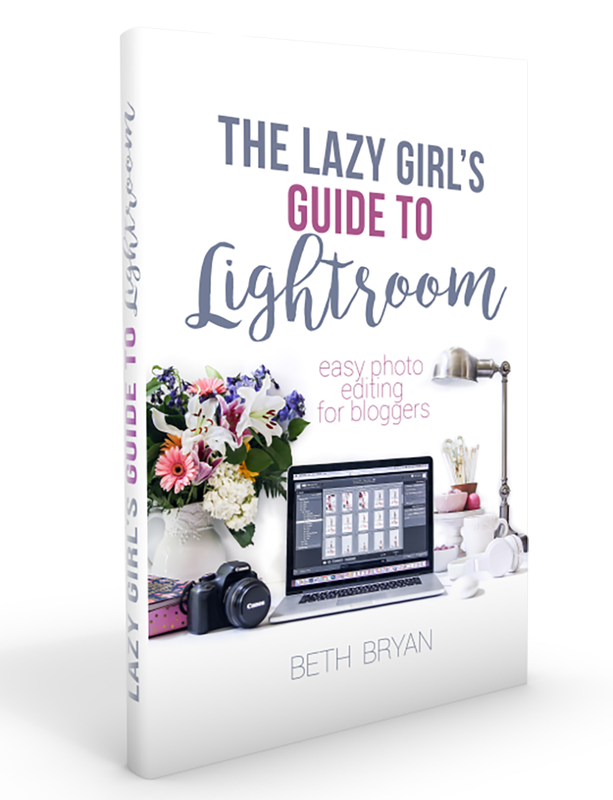 What a great idea, Beth! Thanks for sharing! Love this! Not only does it say Happy Thanksgiving, Happy Autumn, I love the fact that you just have to pick the whole thing up in one fell-swoop because it’s all sitting on the reclaimed wood! Yep, definitely my kind of tablescape! Beautiful!! 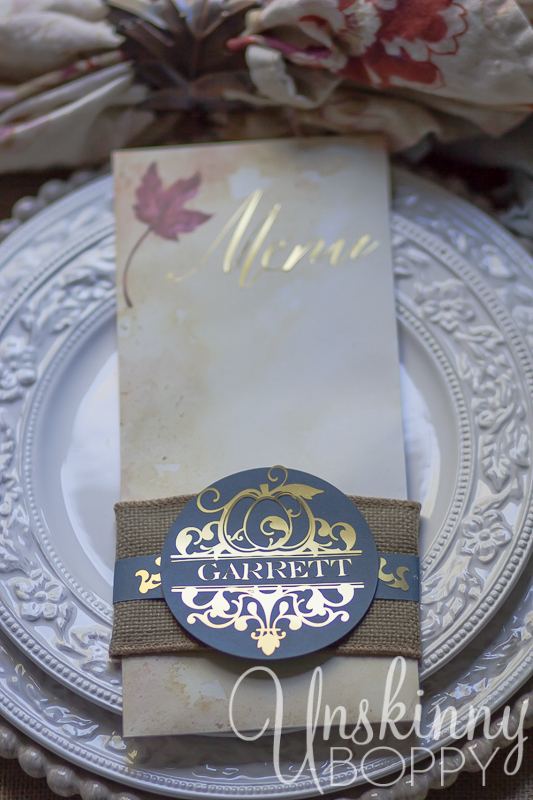 Such a pretty place setting and I LOVE your centerpiece! Pinned! 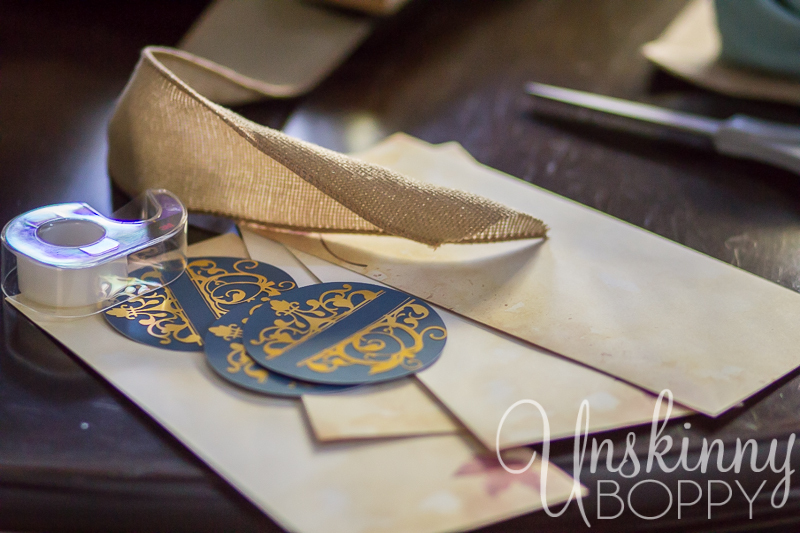 This is so pretty and I love the gold foil cut-out! Very nicely and elegantly done, Beth! Love the pumpkin print, too! Thanks Julie! I am in love with all of Kolette’s designs– she has some stunners. I know what you mean about place cards. I never want to make family and friends feel they HAVE to sit at a certain place. 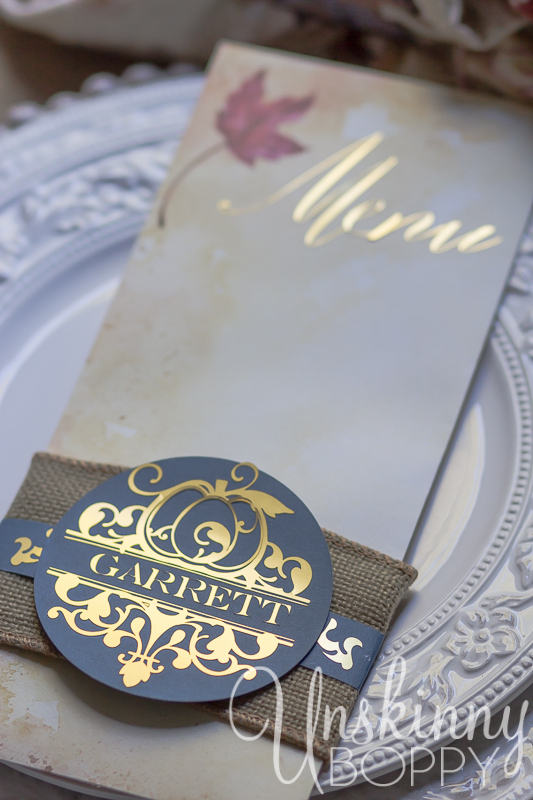 Here’s how I handle place cards when I use them…I make up the place cards with the names, (looking spectacular of course:) And since I serve buffet style I have the guest pick up their place card from a designated area where I have them displayed, take it to the seating of their choice, then they pick up their plate and leave their place card and head to the buffet line. Works great. Now THIS is an excellent idea. I am so going to do this at my next big event! So many pretty touches! Love what you did here! Where is that cakestand from? I love it. It was sold by Willow House years ago. I love it too, but they are no longer in business. Sorry I’m not more help.